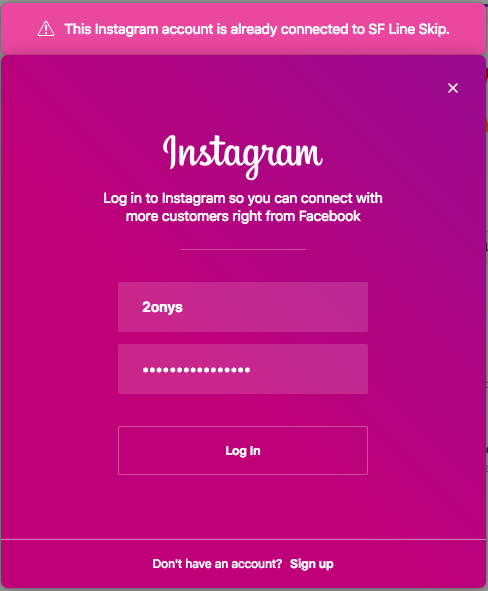 This will address a few common issues that may come up while linking your Instagram and Facebook during the SocialCert process. Error: "Failed to link Instagram account"
If your Facebook page was created via a Business Manager, your personal Facebook account may not have access to the Facebook page. To fix this error, you must assign your personal Facebook account as an admin to the Facebook page. Error: "This Instagram account is already linked to [fb-page]"
If your Instagram account is linked with a different Facebook page than the one you'd like to SocialCert with, you will encounter the error above. To address this issue, you must go to your Instagram settings and unlink the current Facebook page. After you've unlinked your previous FB page, please connect the correct FB page via the SocialCert process. Have any other questions on linking your Instagram and Facebook page? Feel free to email us at socialcert@lumanu.com.